An architectural rendering of what the high-density Library Storage Building will look like when completed. Courtesy of Perry Dean Rogers. Fayetteville, Ark. — A library storage building under construction on the University of Arkansas campus is the first demonstration of mass timber design and construction in the state of Arkansas, according to university officials. Ground was broken for the facility in July 2017 and construction should be completed by July 2018. Perry Dean Rogers is the design architect for the facility, and Miller, Boskus, Lack Architects is the architect of record. ConReal is the general contractor. A high-density storage facility is under construction off Hill Avenue in south Fayetteville, Ark., designed to house University Libraries items in a climate-controlled environment. The 27,000-square-foot storage facility will hold approximately 1.8 million volumes when filled to capacity. The facility will also have a preservation and conservation area where materials will be cleaned, repaired and restored, as well as a workspace area for staff. Mullins Library was last expanded in 1997, when the student population was around 15,000. The student population in fall 2017 is 27,558 and is projected to continue to rise. The increase in students has resulted in higher demand for study space, collaborative space, and creative workspace. At a time when print use is declining and demand for space is at a premium, the Libraries have the opportunity to free up space and resources in the heart of campus by prudently managing physical collections, thereby allowing for more study and collaborative workspace for faculty and students. Cross-laminated timber, known in the trade as CLT, originated in Germany and Austria in the 1990s, and is a cost-competitive, sustainable, and environmentally friendly alternative to concrete, masonry and steel construction. A CLT panel is constructed of timber planks that are stacked, glued and laminated in perpendicular layers under heavy pressure. The panels are pre-fabricated according to the builder’s specifications, then shipped to the building site and assembled, greatly reducing the construction time and eliminating construction waste. CLT panels offer many advantages over traditional construction methods and materials, including improved dimensional stability to wide and tall construction, such as in the Libraries’ storage facility. In addition to providing a higher fire resistance and a higher building hardening rating on the Fujita tornado scale, CLT panels are lighter and thinner than steel and concrete construction, allowing for less massive foundations, structural supports, and roof, all of which make the building more cost effective to build. They also offer sound insulation, long term structural integrity and durability (even rated against earthquakes), and warm more quickly and hold warmth longer than concrete and steel. 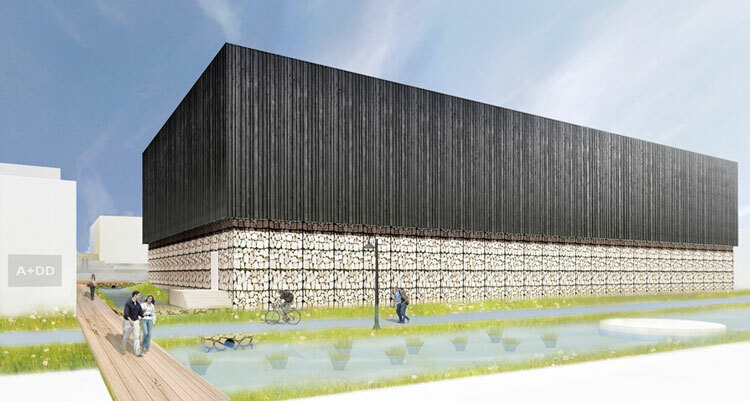 In keeping with the green construction method of the CLT panels, the exterior of the Libraries Storage Building will be fire-hardened wood siding with a base of gabion baskets filled with native stone — all sustainable and environmentally friendly components.